If you’re in the market for a new gaming chair, you may be checking out the premium brands. And why wouldn’t you? They’re cool and flashy. But gaming chairs such as the Vertagear S-Line SL2000 are not cheap. And a high price tag doesn’t automatically equal quality. So unless you have money to burn, you may want to make sure the chair is worth the money. While no chair is absolutely perfect, reading reviews such as this one may give you a good idea if this one will work for you. Or if you should keep looking. Since Vertagear’s inception in 2015, they have shown their commitment to products that cater specifically to the gaming community. Their sleek designs combined with functionality have made Vertagear a trusted name in luxury gaming chairs. First, the SL2000 is relatively inexpensive for a premium gaming chair. However, it is still pricey. So this product is a good option for someone with a generous budget. Next, this is the slim design model of the S-Line series. While it fits many body types, the narrow specs make this chair optimal for slim to average bodies. If you have a wide body type, especially through the shoulders, you may want to look into the P-Line instead. The box includes the chair in easy-to-assemble pieces. You receive the high backrest covered in PVC leather as well as the seat with armrests already attached. Also in the box is the aluminum alloy five-star foot base, gas lift, casters, screws, tool, and adjustable cushions. Is the S-Line SL2000 just another racer-style gaming chair? Maybe. But it’s really sleek and comes in 11 color combinations. If you were to make a buying decision based on looks alone, this may be the one for you. Fortunately, the SL2000 is more than just a pretty face or cover. It has a steel frame with high-density foam that ensures that it lasts for a long time. The chair exterior is also covered in high-quality PVC leather in eye-catching colors. The PVC material makes it relatively durable and gives the chair a luxurious look. In addition, the chair adjustments are relatively basic. The backrest reclines up to 140 degrees. And the seat tilts with tension. It also has a locking mechanism to keep the chair static if rocking isn’t your thing. The armrests only adjust up and down, but this is to be expected of a lower model in any series. You can always remove the armrests by unscrewing them from the base if it suits your play style better. Ideally, this chair is a good option for people up to 6’3” with a relatively slim build. The seat rises to a maximum height of 19.5 inches and lowers to approximately 16 inches. It also has a maximum weight capacity of 330 pounds. However, the chair is relatively slim through the shoulders. Officially, the measurements through the shoulders of the chair are 21.3 inches. But keep in mind that includes the high “wings” of the chair. Since it isn’t comfortable to wedge your shoulders into this curvature, count on a few inches less than that for shoulder clearance. So if you have broad shoulders, you may want to try this chair out first or look at another model. Lastly, Vertagear has made assembly easy with “slide-in” designed pieces. Most people assemble their chairs by themselves even if two people are recommended. But the manufacturer accounted for this tendency and made installation simple for just one person. If you have your heart set on buying a Vertagear, but need a little more room in your seat, you may want to check out the P series. The Vertagear P-Line PL6000 is a little bigger to accommodate bigger body types and broad shoulders. The recommended height for the user is between 5’9” and 6’8” tall with a weight maximum of 440 pounds. This chair is available in many vibrant color combinations and also showcases special features that the S-Line does not have. The PL600 chair has premium features such as 4D armrest adjustability, forward and backward back adjustments, higher seat height, and heavy-duty casters. 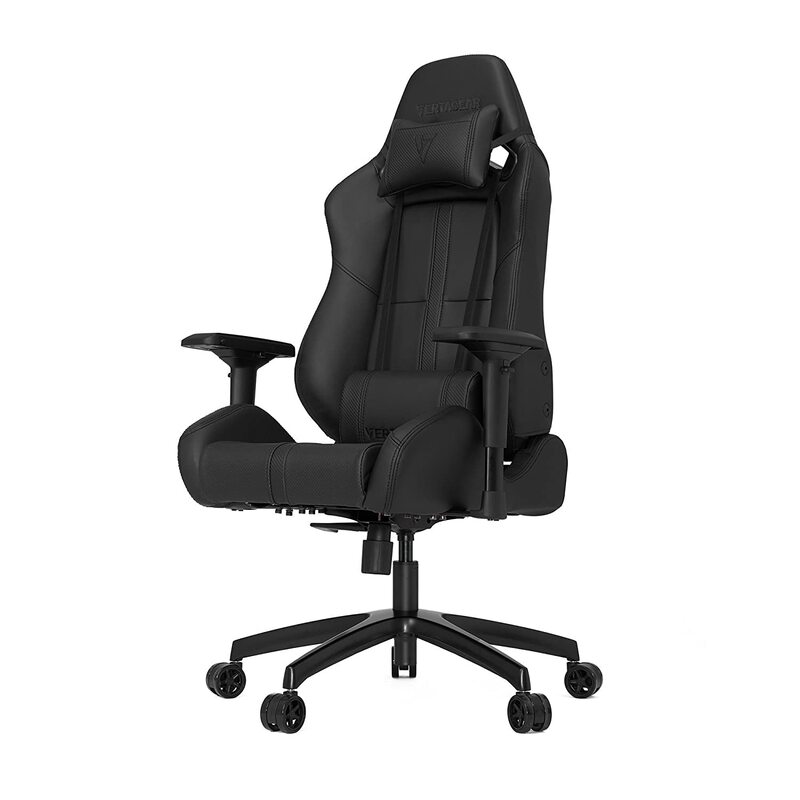 Vertagear is a leader in gaming chairs. And it’s easy to see why. The eye-catching design alone makes it a must-have piece for any rig. Moreover, the quality and utility make it worth the relatively hefty price. But the SL2000 is a slim chair and doesn’t fit everyone. So if you need a bigger chair option, you may want to consider Vertagear’s PL6000 instead. This chair is bigger and comes with additional features that help justify the extra money you would be paying for this chair. Lastly, picking out the perfect chair depends on the individual. Your comfort is the main consideration. So pick one that fits your body type, play style, and budget. After all, you will be the one spending hours grinding in a session so you deserve a chair that supports this endeavor.